"This is the large circle situated in the southern extremity of the group ... undoubtedly one of the best preserved ancient monuments of our country; it is uninjured by the plow and trees of the original forest are still standing on it." Cyrus Thomas, Report on the Mound Explorations, 1894. By the time Thomas wrote these words, much of "Newark Works" as drawn earlier by Whittlesey, Squier, and Davis had been obliterated by agricultural activity and the development of Newark. 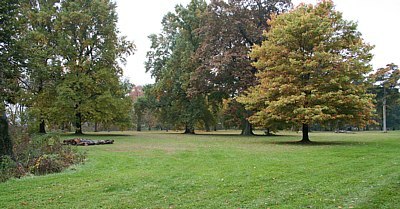 The very scale of the two largest works made them less subject to destruction than other sections of Newark, and other earthworks generally. The Great Circle Earthwork, formerly Moundbuilders State Memorial, survived destruction as the Licking County Fairgrounds before park status. 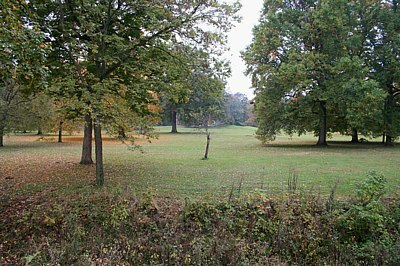 The Octagon, another Ohio Historical Society property, is leased to Moundbuilders Country Club and used as a golf course. The Octagon remained nearly intact when Thomas surveyed in the 1890s; albeit a portion was cleared and reportedly impacted by plowing. Left. 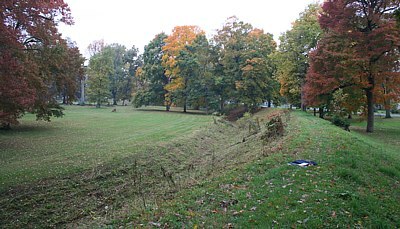 View of the Newark Great Circle embankment and inner ditch from atop the northwestern section. 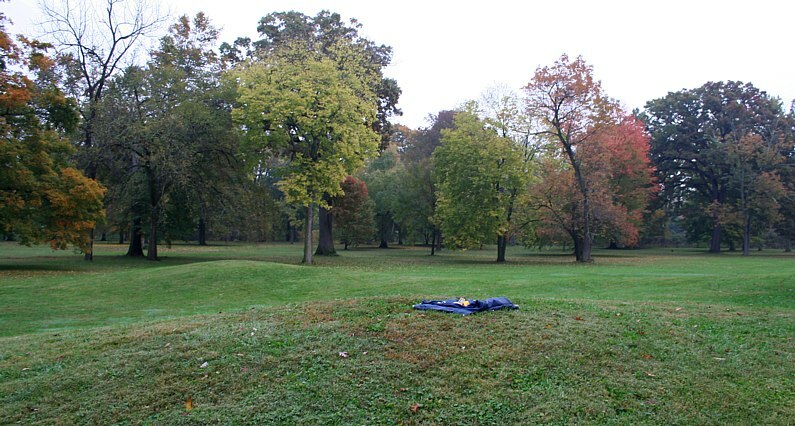 This open, less-wooded section of the circle affords a good view of the Great Circle's monumental scale. The Great Circle is actually an ellipse measuring from 1163 to 1189 feet in width. Below. 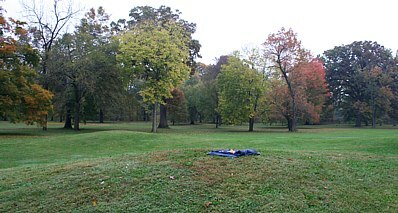 A section of the northeast portion of the circle. 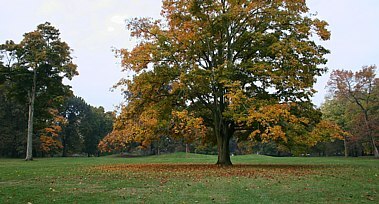 Everywhere around the circle, large trees enhance the site's grandeur. Fortunately E. G. Squier and E. H. Davis (1847), Cyrus Thomas (1894), and others undertook original surveys and explorations prior to the destruction of many sites. 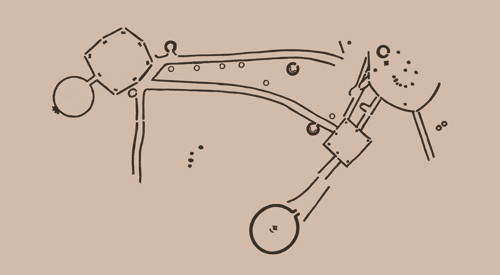 The Squier and Davis survey results, published by the Smithsonian Institution, include detailed illustrations of the sites. 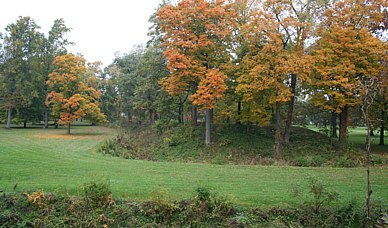 About Newark Earthworks, Squier and Davis stated, "These works are so complicated, that it is impossible to give anything like a comprehensive description of them." 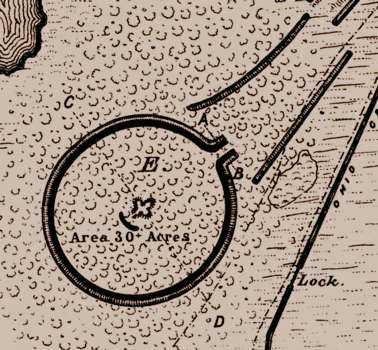 The Newark array of circles, a square, an octagon, parallel embankments and circular and elliptical mounds was the most diverse, extensive and complex of earthen monument sites. 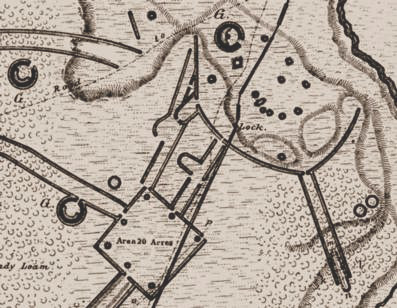 The Great Circle has the highest of the embankments at Newark. 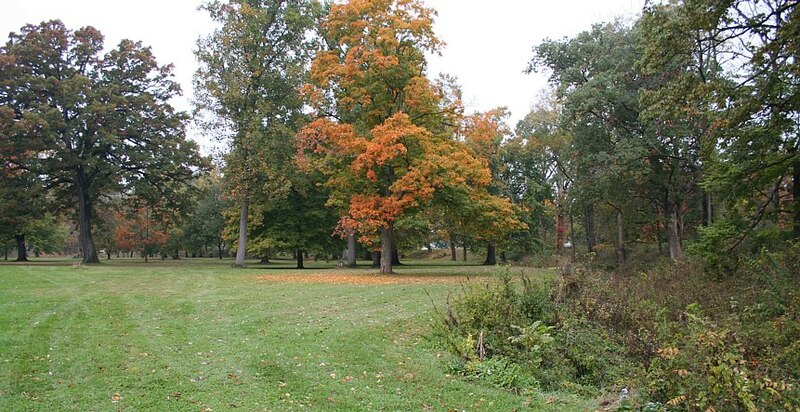 Based on survey, in this section of the "Newark Works," Whittlesey, Squier, and Davis (1837-47) reported nine feet high and 45 feet wide at their base embankments surrounding the seven feet deep and 35 feet wide ditch. They reported the entrance is emphasized with 16 foot high embankments above a 13 foot ditch. With summer vegetation, the views across the full breadth of the Great Circle are fleeting few. 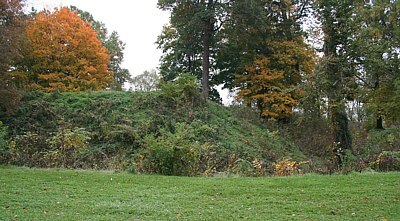 From the northern arc's embankment, the group of four co-joined mounds at the center of the circle (Eagle Mound) are discernible as small rises of earth. The mound form, variously described as an arrow, or a bird, or just co-joined mounds, covers the remains of a large ancient structure, as do some other mounds in the region. 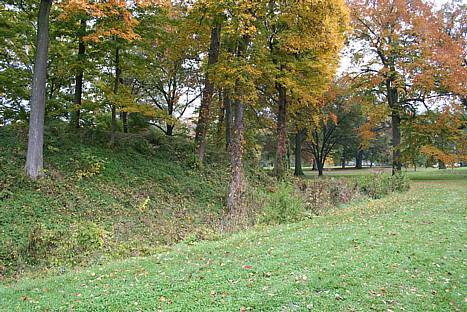 The arrow-form layout of the four distinct hummocks pointing to the entrance is noteworthy. 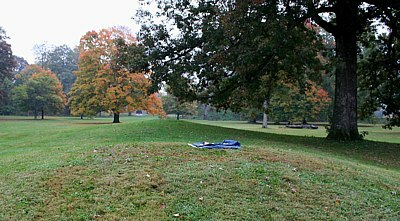 On Eagle Mound, the GPS receiver (right) was reading slow early in the day with morning cloud cover. From Eagle Mound, the central mounds (below), the monument entrance frames a lunar alignment—the northerly minimum lunar rise azimuth. The museum entrance arch is also framed by Great Circle's gateway. 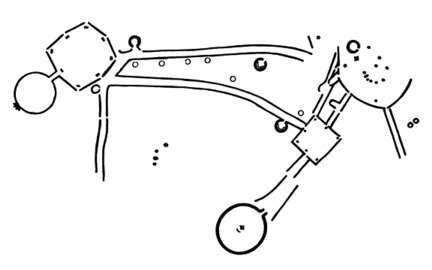 The entrance is km/6 from Eagle Mound, bearing North 67.12° E. of N.
The panorama of views below continues clockwise, left-to-right around the circle interior from the gateway. The last GPS reading was from the center of the gateway along the embankment arc. The position where the Great Circle impressives the most is between the 100 foot long parallel embankments framing the singular entranceway. The embankment readings were made beginning and ending with the embankment gateway corners, and circulating ENWS twelve readings (from nca to ncl, table of readings below). Above. 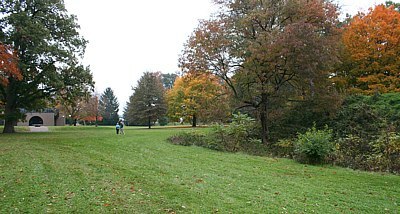 On the right, the ditch, like the parallels, extends outward in the entranceway. Left. The corners of the circle and the gateway parallels are the highest points of the embankment, at 16 feet. The largest tree in this image forms the edge of the image below. A view of the gateway below, last of the panorama series, is taken from the embankment corner on the left, atop the 16 foot bank looking across the gateway. 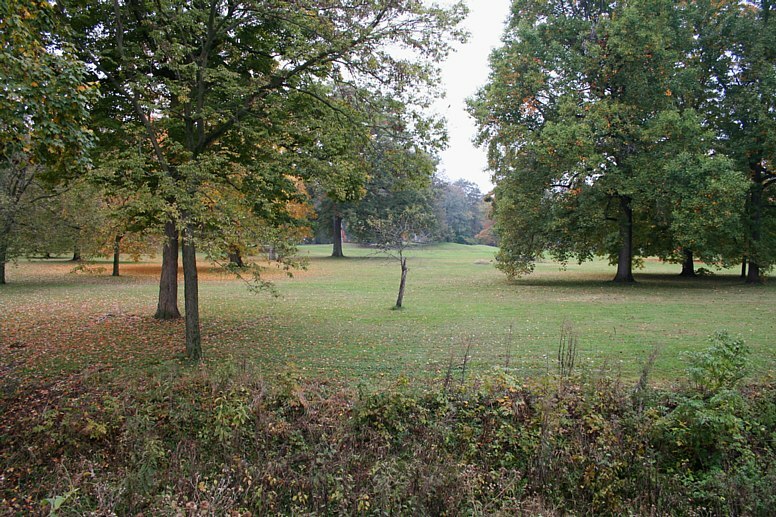 Looking southwest into the Great Circle from the entrance, towards the south of Eagle Mound. Eagle Mound behind a massive maple. Another grand maple northwest of the entrance on the edge of an old growth grove. Left. Looking across the entranceway. Below. Looking out the entranceway to the northeast. Of all these earthworks northeast of the Great Circle, today only a small remnant of the square survives. Lepper, Bradley T. Feb. 13, 2007. Octagon Earthworks' alignment with moon likely is no accident. Lepper, B. T. 1996. The Newark Earthworks and the Geometrical Enclosures of the Scioto Valley: Connections and Conjectures in A View from the Core: A Synthesis of Ohio Hopewell Archaeology, edited by Paul J. Pacheco, Ohio Archaeological Council. Salisbury, James A. and Charles Salisbury 1862 Accurate Surveys & Descriptions of the Ancient Earthworks at Newark, Ohio. Manuscript, American Antiquarian Society, Worcester, Massachusetts.